From upper left: National Congress of Brazil, Juscelino Kubitschek bridge, Monumental Axis, Palácio da Alvorada and Cathedral of Brasília. Brasília (bɾaˈziliɐ) is the capital city of Brazil. 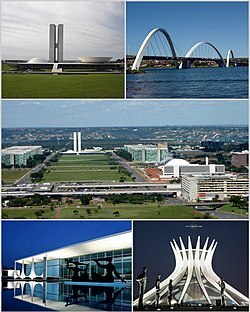 The name is commonly spelled Brasilia in English. The city and its Federal District are in the Central-West region of the country. It is on a plateau known as Planalto Central. Brasília has a population of about 2,557,000 (3,599,000 in the metropolitan area) as of the 2008 IBGE estimate. It is the fourth largest city in Brazil. But the Brasília metropolitan area is the sixth largest in the nation. It is listed as a World Heritage Site. Brasília hosts 124 foreign embassies. Viewed from above, the main portion of the city resembles an airplane or a butterfly. The Monumental Axis goes east-west and holds government buildings and monuments. The other axis is curved in a north south direction. The city is commonly referred to as Capital Federal, or simply BSB. As the national capital, Brasília is the seat of all three branches of the Brazilian government. The city also hosts the headquarters of many Brazilian companies. Planning policies place residential buildings around expansive urban areas. The plan includes large avenues. It divides the city into sectors with different purposes, including accommodation and tourism. The city is built around an artificial lake, Lake Paranoá. Residents of Brasília are known as brasilienses or candangos. (The candangos are people who moved to Brasília when the city was established). In local usage, the word "Brasília" usually refers only to the First Administrative Region within the Distrito Federal (Federal District), where the most important government buildings are. Brasília has a unique status in Brazil, as it is an administrative division rather than a legal municipality like nearly all cities in Brazil. 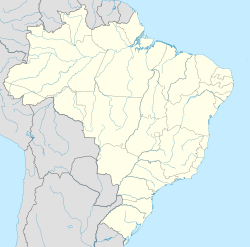 In the rest of Brazil, Brasília is almost always means the Brazilian Federal District. There are several "satellite cities," which are also part of the Federal District. The city was planned and developed as a new town in 1956. Lúcio Costa was the principal urban planner and Oscar Niemeyer was the principal architect. Roberto Burle Marx was the landscape designer. They created the Plano Piloto de Brasília. Brasília was built in 41 months, from 1956 to April 21, 1960. The Brasília subway system (Metrô de Brasília) has 24 stations on two lines 42 km (26 mi) long. The subway currently covers the south half of the metropolitan area. In 2010, a light rail line was added. By 2014, the light rail line will go from the end of the north wing of the city to the airport in the south. Brasília International Airport is the main airport in Brasília, connecting the capital to all major Brazilian cities and many airports in other countries. It is the third most important airport of Brazil, in terms of passengers and aircraft movements. ↑ "Lista do Corpo Diplomático e Organismos Internacionais". Cerimonial, Ministério das Relações Exteriores. Retrieved August 18, 2011. ↑ "Lucio Costa". Infobrasilia.com.br. Retrieved May 5, 2009. ↑ "Google Maps". Google. January 1, 1970. Retrieved May 5, 2009. ↑ "About Brasilia". About Brasilia. Retrieved April 17, 2010. This page was last changed on 5 April 2019, at 22:21.